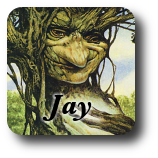 1/15/2014 - I had to stop myself from making a single card out of these to Prey Upon variants. The original idea was Hunter's Grapple, that tapping the creature that's fighting seems like a reasonable cost. 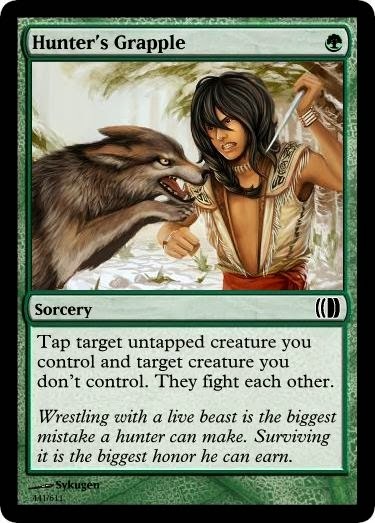 But when I first made that, I needed a way to make the card better and found the art for Track with the Tribe which led to the idea of a group hunt as seen on that card. Fortunately I realized at the last moment that tapping didn't help the group flavor and vice-versa, so I broke them apart. While it is a bit worse on average, Hunter's Grapple isn't strictly worse than Prey Upon, it's just aligned to a less common green strategy. You can no longer kill the opponent's last relevant blocker and then swing with the same creature, but you can send a chump in to distract that blocker so the rest of your team can get in. 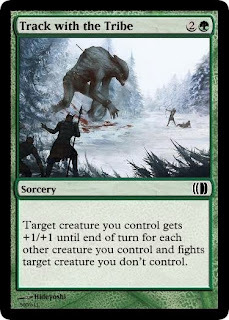 Also better with lots of small creatures rather than a single big one, Track with the Tribe doesn't offer a permanent bonus like Hunt the Weak, but can allow a small creature to take down a big one. Neither of these are positioned to excel in the average set. You would either want a set where green gets paired with white a lot, where green borrows a chunk of white's army spiel, or where green is too strong for Prey Upon and needs something harder to use. Does the opponent's creature have to be untapped for Hunter's Grapple? The wording is unclear. Instinct says yes but I'm not sure. Would say "and target untapped creature you don't control." I would just slightly clean up the templating on the second one like this, "Target creature gets +1/+1 until end of turn for each other creature you control. Then, it fights target creature you don't control." The first time I read it, while fine, felt like it was more complicated than it is. I was thinking of suggesting the same thing. Chunking words like that can help a lot with readability. Tap target untapped creature you control and target creature of an opponent's choice he or she controls. Those creatures fight each other. The tapping in that card (or in Hunter's Grapple) makes me feel uneasy. It makes the cards close to strictly worse than Prey Upon (not to mention pit fight, since that card heavily implies you can have Prey Upon at instant speed), but it also introduces tapping down enemy creatures in colors that do not normally have it. I like tapping at sorcery speed in Red. Falter/Stun effects always seemed to make more sense there than in White/Blue, which is where they've somehow seemed to end up, recently. I agree that it feels off in Hunter's Grapple; the ability to use it this way is what pushed me to try it in red. As for power level, I'm happy with green's default being Prey Upon and Red's being closer to this - and at the end of the day, Bull Rush was played. I find tapping more reasonable in green than in red, personally. I think fight should be tertiary in white, to make the tapping fit and because it enables a lot of other interesting designs.